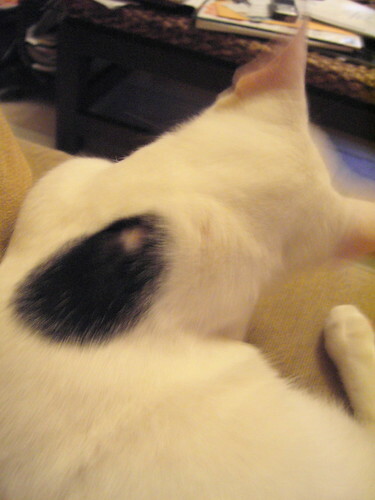 In the ten or so minutes that elapsed between when I got home and snuggled Ink, and hearing Terz holler from the kitchen, the little critter managed to tear a wee patch of fur off his back. Has your cat done this several times? Better go to a good vet and not just any old vet to find out why. My cat years ago started overgrooming himself and we thought he had a skin problem. After many visits (his fur had bald patches all over), one vet even said it may be psychological and we might have to resort to drugs.. Anyway I went to Dr Hsu at Animal Clinic and after listening to description of symptoms he straight away said, let's test for hyperthyroidism. Test came back positive. One radioactive injection later, matter was fixed. And make sure your cat heals fully before he can lick that area again. My cat had a similar problem in the same spot, I think from a cat fight. The skin kept tearing wide open even when he just licked it. Use the cone collar if you need to, better to get it well.